You may have heard that Google recently released their standard camera to the Play Store. You may have also heard that it's a pretty high-quality app with some neat features (it is!). But let's say you're a Moto X user who wants to use the new camera, but loves the built-in twist gesture that allows you to instantly launch the camera app, even when the screen is off. To do this, you'll need to install the Xposed Framework (which does require root access) and then find a module called "Twisty Switch." In the module (once you've enabled it), you can set the new Camera (or any other app, really) to be launched with the gesture. And that's it! You don't even need to disable the gesture within the stock camera. I have noticed that while this does a great job of recreating the functionality, it's not quite 100% the same. For one, you can no longer launch the camera without unlocking the phone if you're password protected (though it does open as soon as you type in the password). In addition (and I could be imagining things), it seems a little more sensitive, so be sure you don't accidentally launch the camera and take video and/or pictures of the inside of your pocket (I have done both). But if this was the only thing standing between you and the new camera, it may definitely be worth a look. 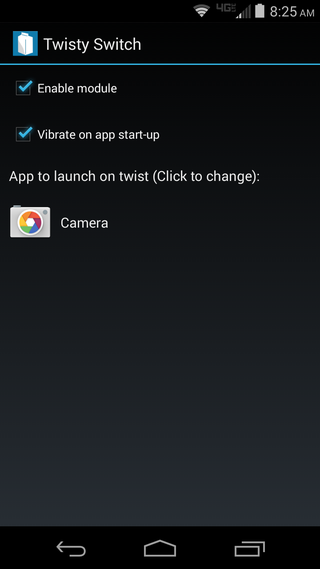 UPDATE: A recent update to the Motorola Camera app has broken Twisty Switch's functionality. The dev does not intend to fix this, so at the moment the only way to get Twisty Switch working again is to uninstall the Motorola Camera app's updates from the Settings > Apps menu. Once that's done, go back into Twisty Switch, disable it, and then enable it again.